www.johnseed.com: Has the Art Market Gone Medieval? Has the Art Market Gone Medieval? "The Museum of Relics," Photocollage by John Seed via Photofunia.com On the 26th of March, several news sources reported that casino magnate Steve Wynn had sold Picasso's 1932 painting "Le Rêve" to hedge fund owner Steven Cohen for $155 million dollars. Mr. Cohen apparently felt like doing some art shopping and image burnishing after having paid a fine of $614 million to settle accusations of insider trading without any admission of guilt. Cohen had been coveting "Le Rêve" for some time, but a previous sale agreement had fallen through after Steve Wynn, who suffers from the degenerative eye disease retinitis pigmentosa, accidentally tore a small hole in the work with his elbow in 2006. "My feeling was, it's a picture, it's my picture, we'll fix it. Nobody got sick or died." Those seem like the words of a man who values people more than he values art. His sentiments - if sincere - mark him as exceptional in an era when blue chip works of art are commanding stratospheric prices that serve as reminders of economic inequality. He is right that even an especially fine Picasso is just a picture. Just what can you say about a society in which a picture is worth so much when so many are facing poverty? It boggles my mind that one of the four existing versions of Edvard Munch's painting "The Scream" sold last year for $119.9 million. Such a vast sum of money could do so much to relieve suffering, but instead it was spent on a painting of suffering. As the prices of famous works of art rise, are we in some way going backwards in history? There is something Medieval about the collecting habits of today's super-rich. It goes without saying that the rich have always been the most avid collectors of art, but frenzy at the top of the current art market that suggests that today's collectors are motivated less by the aesthetic value of their purchases than they are by a kind of religious fervor and supernatural faith in the transformative power of their purchases. Blue chip works of art are now being bought and sold as relics. Relics were bits and pieces of items that were directly connected to saints and their miraculous lives. During the medieval period splinters from the alleged true cross, finger bones of St. John the Baptist, and even alleged bits of Christ's foreskin -- the Holy Prepuce -- were avidly collected. Huge prices were paid, especially around the time of the crusades, and the market for relics was flooded with fakes. The situation got so bad that in 1287 the pope was given final authority in disputes over the authenticity of relics. Owning a relic made Medieval collectors feel directly connected to the much venerated saints of the period. Relics also served as guarantees of political prestige and spiritual authority. Encased in lavish gem encrusted containers known as reliquaries, relics made their owners feel holier-than-thou regardless of their actual piety. Relics also were -- and still are -- major attractions for cathedrals, drawing visiting pilgrims by the score and stimulating local economies through tourism. Opposition to the cult of relics was most often treated as heresy. As you can see, it isn't to hard to draw some comparisons between the way relics were collected and displayed and the way high end art is collected and displayed. Famous artists -- living and dead -- achieve the status of "saints" and collectors transcend their sins by acquiring and displaying physical manifestations of miraculous creativity. 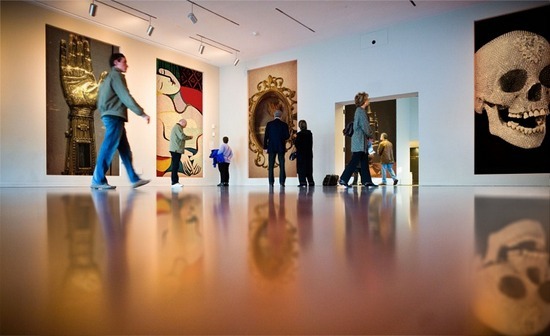 Art museums are cathedrals, curators are priests and museum visitors are pilgrims seeking contact with the supernatural in the physical form of works of art. 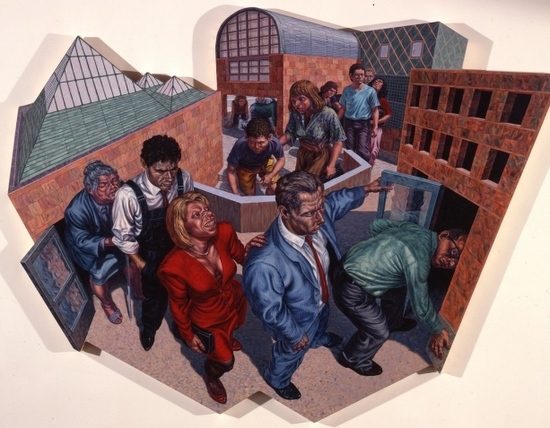 F. Scott Hess, "Procession," 1988, oil on shaped canvas, 84 x 114 inches If it strikes you that my comparison is a bit facile, keep in mind that works of art really should be appreciated in a very different way than relics. Works of art are meant to use aesthetic means to move us, speak to us, and to inspire us. Great works of art appeal to our senses and to our intellects. The finest works of art can speak directly to you in a transcendent language, and the dialogue you can have with them benefits from education and maturity. In other words, great works of art say the most to those who take them in with the greatest receptivity and consideration. There is a reason that works made during and after the Italian Renaissance appeal to us in different ways than Medieval works of art: they come from a tradition that was opened up and enriched by Humanist thinking and the rich philosophical and mythical content of Greco-Roman civilization. Relics appeal to something else: our need to project piety and to advertise our connection to those who apparently have or had extraordinary powers. Relics can serve the wealthy as a way of cleansing their reputations and deflecting criticism of their actual deeds and actions. It doesn't require education to appreciate a relic: their holiness doesn't require aesthetic appreciation which is replaced by superstition and a humble sense of awe. All you have to do to get the full effect of a relic is to be in its presence. One more thing about relics: although they were often displayed beautifully, relics themselves are not beautiful because they didn't have to be. Finger bones, bits of skull, and scraps of holy shrouds generally aren't much to look at. Neither are the innumerable giclée prints of Thomas Kinkade, but his "DNA Matrix™" was added to the mechanical signatures on his works to gives his works the vibe of relics. Unfortunately, the observation that cult followings can boost the price of works of art isn't just a feature of the Kinkade market. Thirty years ago when I briefly worked for art dealer Larry Gagosian -- who was a young dealer just starting his career -- one of his clients said something to me that I have never forgotten. "Larry," he commented, "doesn't have a great eye for art. He has a great ear for art." I have thought about that remark for a long time. The way I have come to understand it is to acknowledge that it wasn't necessary for an aspiring art dealer to have a keen visual or aesthetic sense. What mattered was an "ear" for names and market trends. Collectors all around the world want "names" because fame sells and because works by famous artists seem to keep their value in an increasingly superstitious and brand-conscious culture. Interestingly, as the super-rich around the globe pay vast sums for works by the art world's saints, artist's foundations and estates are scrambling to get out of the business of authenticating works: both the Basquiat and Warhol estate have ceased giving authentications due to an excess of contentious lawsuits. Perhaps the new pope could step in and help. I want to make it clear that when the market treats great works of art as "relics" they may still be great works of art. I have a high regard for the works of Picasso, Rothko, Bacon and others whose works have recently brought supernatural prices. What concerns me is that their works -- as Steven Wynn would point out -- are just pictures, not people. Mr. Wynn's Picasso was apparently pretty easy for a good conservator to patch up: human beings aren't nearly so easy to fix.